Now you are familiar with the Starting Hands chart and how to use it, let’s take a more detailed look at the types of hands that are in the chart, and what we are looking for with each type of hand. All of the hands in the starting hand chart fall into one of the four categories below. Lets take a look at each in turn. It’s always a nice feeling to look at the cards you have been dealt and see a big pocket pair. These are powerful hands and hands that should be played aggressively, however you should also be aware that if these hands are played badly then there is an increased chance you may not win the pot. Before the flop, there is a good chance you have the best hand especially with AA, or KK. The only way someone before the flop is ahead of you is if they have a higher pocket pair. 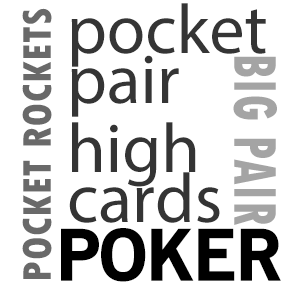 Our first aim with big pocket pairs is to limit the field, and to do this we act aggressively before the flop. We want most opponents to fold, and if we raise or re-raise then most weaker hands will get out of the way. Ideally with a big pocket pair we want to be playing against a maximum of 2 opponents. The reason for this is that big pocket pairs become a much weaker hand when played against multiple opponents, because of the increased chance that one of those opponents will hit cards that make their hand better than your pocket pair. Too many beginners slow play these hands by just calling the big blind, allowing multiple opponents to see the flop. This will lead to a lot of bad beats with your pocket Ace’s getting beat by an 8-6 that was allowed to limp in and hit two pair on the flop!!! By being aggressive and raising before the flop, not only are we protecting our premium hand by limiting the field, but we are also getting more money into the pot at a time when we have a very strong hand. So what are we looking for on the Flop? Well obviously hitting a third card on the flop to make three of a kind would give us a monster hand but this will only happen about 1 in 8 times. We are (in a lot of cases) already ahead before the flop with our big pocket pair, so all we are looking for from the flop are cards that are lower than our pocket pair and no scare cards that could help our opponents overtake us and take the lead. An ideal situation would be for cards lower than our pocket pair to come on the flop and our opponent to hit top pair, in which case he might think he is in the lead and be prepared to put a lot of money in the pot. We hold K K and the flop comes down 2 A 9 , all of a sudden anyone who is holding an Ace has taken the lead and because your opponents have already called a raise to play this hand the chances are high that they hold an Ace in their hand. We hold A A and the flop comes down 7 8 9 . This is a very worrying flop, as there are both Straights and Flushes on. Although it may be a hard lay down in certain situations you will have to consider laying down a big pocket pair, if a big bet is made and you think there is a chance you could be beaten. If you believe you are still in the lead after the flop then carry on betting aggressively, so that your opponents are forced to make a decision and pay to carry on, if they are on a draw and you let them have free or cheap cards on the turn or river, they could bust you. If a scare card comes then you will have a decision to make. By all means make a bet to see how your opponent acts, but if they start raising you or calling very quickly then be prepared to fold your hand as they could have you beat. The definition of high cards is any two unpaired cards which are both a 10 or higher. These hands can again be strong hands, but would be behind before the flop to anyone holding a pocket pair. With these hands you need to hit cards to make it into the best hand. On the flop we are looking to hit top pair, so if we are holding AQ, then you want the flop to come down with either an Ace or Queen as the top card on the flop. What you don’t want is 2nd pair, so in the example above if the flop came down K Q 3 you would be very wary of someone holding a King. We are also looking for powerful draws, A nice flop could give you Straight draws, and if you are holding suited high cards then you could also be in line for a powerful flush possibility. Careful aggression is the way to bet these hands. We know why it is important to be aggressive, but we should also be wary of hands that could be beating us with these sorts of cards. In the example above even though we have hit top pair with a pair of Queens we could still be behind to someone holding pocket Kings or Aces. Although these are decent hands to play, and you may be in the lead before the flop, these are hands that are easily beaten and can be difficult to play after the flop. What we are looking for here is to hit a third card on the flop to make three of a kind. It’s about a 1 in 8 chance of hitting, but when we do hit, then we have not only a very powerful hand, but also a disguised powerful hand. Lets say we hold 8 8 and the flop comes down A 8 5 . Anyone who is holding top pair with Aces will be fairly confident thinking they are in the lead and will be prepared to put money into the pot, not realising that they are actually way behind to your three of a kind. You will find that opponents make mistakes in this sort of situation and as you know we profit from our opponents mistakes. The ideal turn or river card to come above would be another Ace as anyone holding an A in their starting hand would have hit three of a kind and will be prepared to put a lot of money into the pot, a pot which you are going to win with your disguised full house 8-8-8-A-A. If you do not hit your three of a kind on the flop, then it is likely that you will no longer have the best hand, especially in a multi-way pot. Here we would be looking to fold to any large bets. Don’t chase the hand, if you don’t hit your three of a kind on the flop then I suggest you fold your hand to any decent bets. If your hand has gained more ‘outs’ (cards that could hit that can improve your hand) eg: you hold 8-8 and the flop comes down 9-6-7, here you have picked up an open ended straight draw with any 10 or 5 that hits on the turn or river making your hand into a straight. All the cards on the flop are lower that your pocket pair – in this situation you may still have the best hand but be careful of straight possibilities. In the above situations it may be the correct move to stay in the pot depending on the amount that your opponent is betting. With these hands we want to get into the pot cheaply to see the flop and we want to be playing in a multi-way pot (multiple players) so that the pot is a reasonable size. The reason for this is with drawing hands we will be considering the Pot Odds, this is something you will learn about in more detail later on in the course. Although these cards are not individually very powerful, they can give us a chance of drawing either a straight or a flush, or even a mega monster hand such as a Straight Flush. By being in the hand we always have a chance to flop other hands like two pair, or three of a kind if the flop is kind to us. A gapped connector is very similar to Suited Connectors except there is a gap in between your hole cards (not consecutive). The concept of playing is the same but they are slightly weaker than Suited connectors, which is why there are not many Suited Gapped Connectors in the Starting Hands chart. Here we have the opportunity to draw a Nut flush, if any 3 cards come on the Flop, Turn or River of the same suit we have in our hand, then we have the best possible Flush (with the Ace high) . These hands must be played very carefully though. We are looking to hit 2 pair or better. If we pair our Ace on the flop then our hand is still very weak, because of the low kicker card anyone else who has also paired their Ace will have us beat. Now you understand a bit more about each type of hand and what we are looking to achieve with each. Don’t fall into the trap of getting caught up with a hand when you hit something else other than what you are aiming for. These are often very weak situations and inexperienced players can lose money if they are not careful. Use this exercise to continue to get used to the starting hand chart and knowing what position you are in, but also start thinking about each starting hand you play in terms of what category of hand it is and what you are looking for on the Flop / Turn / River.